Schramm returned to the fold for 1990's Fakebook, a remarkable acoustic folk-pop journey through Kaplan's record collection and a virtual family tree of Yo La Tengoreference points. A wonderfully low-key collection of covers ranging from forgotten nuggets (the Kinks' "Oklahoma U.S.A.," the Flamin' Groovies' "You Tore Me Down," Gene Clark's "Tried So Hard") to absolute obscurities (Rex Garvin & the Mighty Cravers' "Emulsified," the Escorts' "The One to Cry," the Scene Is Now's "Yellow Sarong"), Fakebookalso included a handful of outstanding new originals as well as luminous retakes of the previous record's "Barnaby, Hardly Working" and New Wave Hot Dogs' "Did I Tell You?" 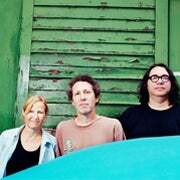 The superb That Is Yo La Tengo EP previewed 1992's May I Sing with Me, the first effort to feature permanent bassist James McNew (formerly of Christmas). A return to noise typified by the hot-wired nine-minute feedback saga "Mushroom Cloud of Hiss," the record balanced out its extremist tendencies with the occasional sidestep into melodic beauty ("Detouring America with Horns") and infectious indie pop ("Upside-Down"). The group also performed a three-night stint as the backing band for Ray Davies on his 2000 U.S. tour, and in 2002 released The Sounds of the Sounds of Science, a soundtrack to the undersea documentaries of French filmmaker Jean Painlevé. That fall, they released the Nuclear War single, which featured several versions of Sun Ra's epic, and that winter performed their second annual Hanukkahpalooza, an eight-night musical festival at Hoboken, New Jersey's Maxwell's, which also led to a special limited-edition EP of Christmas songs. Yo La Tengo released Summer Sun in spring 2003, and that year Georgia Hubleyperformed in Mirror Man, an avant-garde rock opera by Pere Ubu's David Thomas. In 2014, the band looked to its past with an "Extra Painful" special-edition reissue of Painful, which included a wealth of live tracks, outtakes, and demo recordings. Yo La Tengopointed to their history in a different way with 2015's Stuff Like That There, a semi-acoustic set in the style of Fakebook that found them playing covers and re-interpreting material from their back catalog, as well as delivering a few new tunes.